High quality is all the way accepted as the essential for survival of the corporation. Estun sticks to scientific R&D, reliable testing, standard purchasing management and rigid quality control, in order that the company is always running at high efficiency and at lowest cost. Severe quality controls have been arranged in every operational process from product design to purchasing of materials, production, testing, delivery and after-sale service. 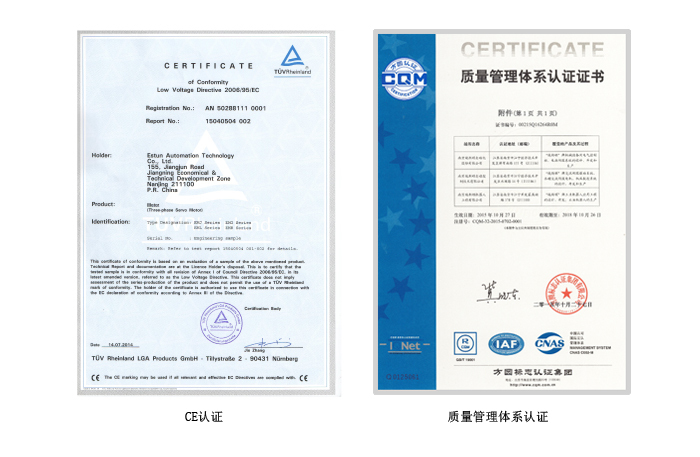 Estun insists on the concept "Customer Oriented" and it is continuously introducing the most competitive solutions by continuous improvements, such that all the users are provided with high quality products in accordance with all relevant national and international standards.We have been certified by ISO 9001 and CE and awarded the certificates as shown below.